bliss is software to find and remove duplicate music files. Scan entire music libraries of any size, then remove duplicates with one click. Congratulations, bliss is a wonderful bit of kit [...] You have a really great tool in bliss. The result of the bliss music library scan is perfect. Just set a few parameters and got professional results. Really amazing. I have a fairly large FLAC music collection for my Squeezebox. Your excellent tool has saved me quite a few hours of work. bliss is a duplicate music finder that finds and removes duplicate songs within an album. bliss scans your music collection, analysing each album to ensure there are no duplicate music files within. 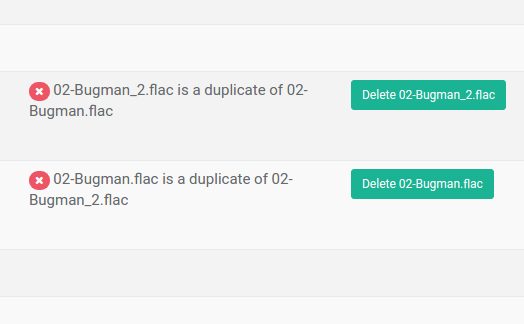 When it finds a duplicate, it offers a one click fix to remove either of the files. It's not just MP3. 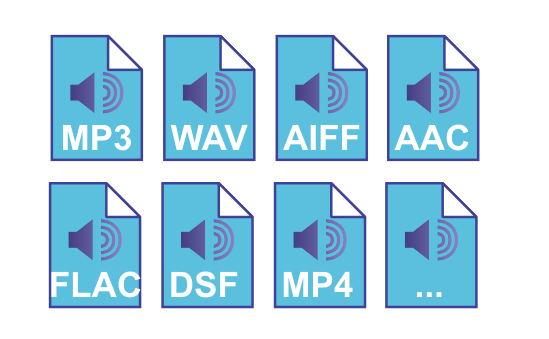 bliss also finds and removes duplicate FLAC, DSF, WAV, AIFF, MP4 (.mp4, .m4a, .m4p and .m4b) (including Apple Lossless), WMA, OGG, and RealAudio music files. Check out the full list. 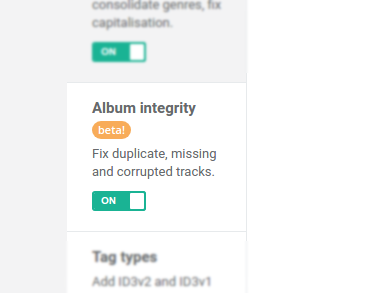 bliss is an automated album integrity checker. This is a developing area of the product, and we hope to add checks for missing and corrupt tracks to the existing duplicate track finder. It's easy to accumulate duplicate music files. One of the main advantages of a digital music collection is its flexibility and the ease of adding music; unfortunately that can lead to duplicates for all sorts of reasons. bliss is focused on the idea of album integrity. That is: how to make sure the albums in your collection are correctly formed. That includes identifying duplicate tracks. 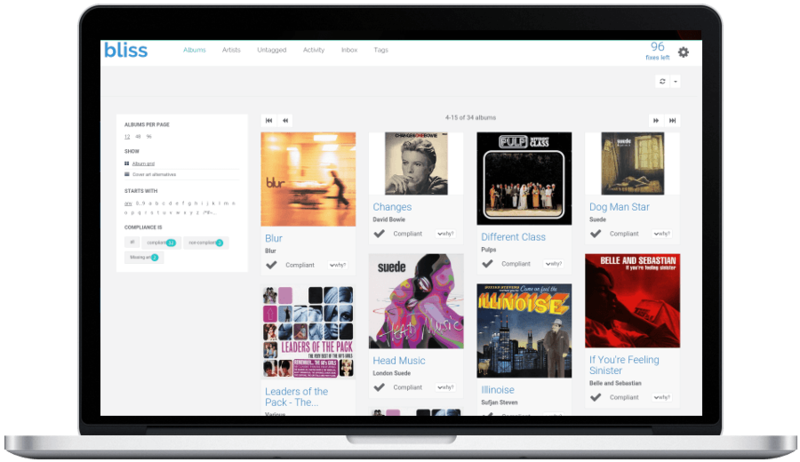 bliss scans your entire music library, identifying duplicate MP3s and other music files. It then presents an option to remove the duplicate music files. This makes finding and removing duplicate music files easy and very low-effort. bliss is ultra accurate; it uses audio fingerprinting to identify duplicate songs. When it finds two or more files with the same fingerprint, it highlights these as identical and offers a fix to remove the file of your choice. bliss works in the background, and can optionally be installed on a NAS or home server. It can be configured to check new music added or updated in your library, so if you accidentally create a new duplicate bliss will detect it and alert you. You access the bliss user interface via your browser, like any other website. It's not just duplicates. bliss also finds missing cover art, organizes music files and is a web based MP3 tag editor.